Nancy’s Theory of Style is a (loose) spin off of Marta Acosta’s Casa Dracula books. Under the new penname Grace Coopersmith she has given (vampire-free) life to Milagro’s bestest buddy Nancy. I was excited about this book because the last Casa Dracula book left me a little depressed, and I was looking forward to some more of Marta Acosta’s unique brand of humor. I was also not looking forward to it because I really didn’t like Nancy as a person (character, whatever) and was not sure I wanted to be stuck in her head for several hundred pages. Luckily for me, since I promised to read it to write a review in return for the book, Nancy grew on me. 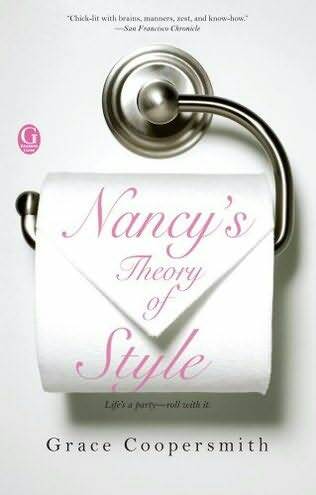 Nancy's Theory of Style is a humorous look at what happens when a woman who has planned her life to be absolute perfection realizes that manufacturing perfection is not the same as achieving perfection. It is a story that almost anyone can relate to, the idea of trapping yourself in a situation whether it's a marriage, job, or even friendship that you later realize does nothing but make you unhappy. Nancy sets out to try to find herself a life, while still not admitting her marriage is over, by moving away from her husband and starting her own business. She gets the gay assistant she's always wanted, the abandoned child she never ever wanted, and discovers that nothing she believed in for her life was true... except for her theories of style. The humor of the novel is spot on, you'll laugh, I promise. Sometimes vacuous Nancy resembles every fake woman you've ever met and yet as she begins to grow she still manages to keep her outlandish personality... especially if you're a fan of made up words or know someone who enjoys flabbergasting others with their "unique" vocabulary. My single problem, other than getting over my initial dislike of Nancy, is Nancy’s attitude towards infidelity. Call it my one pet peeve in life, but infidelity really bothers me, cheaters are not cool, and it is no way to start a lasting relationship. Despite the fact that Nancy’s husband is a total d-bag the idea that he is sitting home waiting for her to come back while she’s boinking gay-Derek’s brains out really put a damper on the book for me.